Northern Tablelands MP Adam Marshall, left, and New England Police Commander, Superintendent Fred Trench, pictured with Senior Constable Cheryl Hall today. 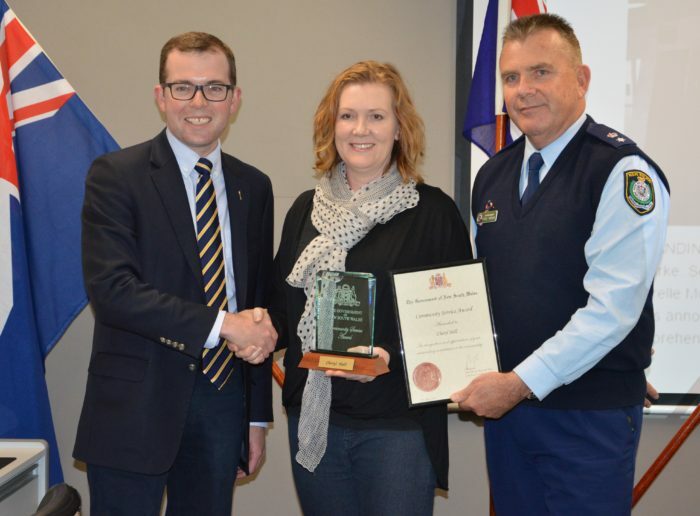 MEMBER for Northern Tablelands Adam Marshall today presented Police Senior Constable Cheryl Hall with a NSW Government Community Service Award for her many years of dedicated service to the victims of domestic violence in the Armidale community. Mr Marshall said it was an honour to present Mrs Hall with her award and he was delighted she had been recognised for her work in the community as a domestic violence liaison officer. “Cheryl moved to Armidale in 2006 and has been an active and committed member of this community,” he said. “She has displayed the finest attributed of the NSW Police Force, but it’s the work she does beyond the uniform that stands here apart. For many years Cheryl has worked as a domestic violence liaison officer where she has reached out to those suffering from abuse. “She has recently begun training as a police persecutor so she can be personally involved in prosecuting perpetrators of domestic violence and other criminals. “Cheryl has organised many charity events over the years, like White Ribbon Family Fun Race Day, to raise funds for victims as well as raise the community’s awareness of this insidious crime. This is now an annual event. Mr Marshall said Mrs Hall has also organised the local Aboriginal Debutante Ball which help build relationship with the Aboriginal young people of Armidale and local police. “Her involvement with the community goes beyond her duties as a domestic violence liaison officer as she is heavily involved with the organisation of the Dancing with the Armidale Stars, the Junior Blue Light Disco, PCYC driver training for underprivileged youths and has is an active member of the Ben Venue P&C Association,” he said. “In 2012 Cheryl was honoured with the Sabine Altmann Award for Domestic Violence Practitioner of the Year which recognises the individual who has contributed in the most outstanding way in her work within the area of domestic violence on behalf of the NSW Police Force.